DUBAI, UAE: Accredited by HAAD and ADA CERP, five table clinic presentations will operate simultaniously from 11-13 September 2014 at CEREC Desert Fest Dubai. Outstanding international trainers will present clinical and lab for both dentists and dental technicians. 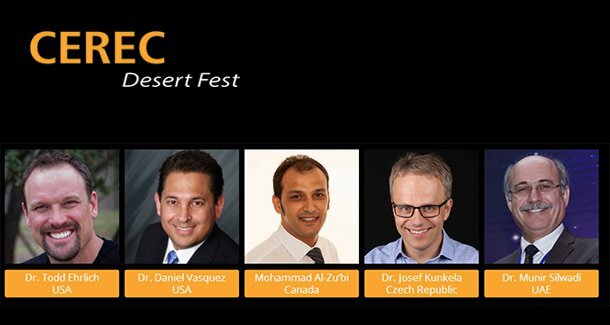 CEREC Desert Fest will be a two day accredited dental spectacle with a Panel Show on 12 September and Table Clinic Presentations (Hands On courses) on 11, 12 and 13 September. Participants can register either for both days or chose any one day to attend and earn up to 20 CME Credits accredited by Health Authority Abu Dhabi and American Dental Association CERP. The five table clinics will operate from 11 to 13 September in groups and registrations include a total of five hands on courses. Outstanding CEREC trainers will run a premiere extensive training for future and advanced CEREC users, clinical and lab. Participants will have the opportunity to interact immediately and ask their personal questions of interest. The practical exercises with CEREC will, at the same time provide inspiration and other means of troubleshooting. The agenda is prepared with close attention to the needs of the modern day Dentist and Dental Technician with a look into how they can improve their skills and enhance the team performance. anterior bridges and their connectors and the latest on CEREC parameters multiple anterior units. Dr. Vasquez was born in Los Angeles California USA and raised in Guadalajara, Mexico. After graduating from dental school at Universidad Autonoma de Guadalajara in 1990, he returned to Southern California soon thereafter. Dr. Vasquez has been in private practice since 1999 in San Diego, Ca. Since he acquires his CEREC® RedCam system in 2008 he started focusing in esthetics and Digital dentistry. He develops his passion for CAD-CAM dentistry leading him to be trainer for Patterson Dental and Sirona Dental Latin-American. He has lectured nationally and internationally for Sirona Dental Systems on CEREC BlueCam and Omnicam in restorative process, integration of CEREC /Galileos and “Speaking the same language with Sirona Connect”. Dr. Vasquez is a Apollo DI beta tester for Sirona Dental, Co-founder of CEREC® En Español, Speaker/ trainer for CEREC On Demand and Trainer of Trainers for CEREC Latin America. It is incredible how easy and fast new users learn to operate the CEREC Omnicam. This one day lecture with hands on course will discover how participants can integrate CEREC Omnicam into the practice. The program includes learning the art of digital imaging with the omnicam as well as hands on imaging, designing and milling a posterior full crown with Vita Suprinity, implant crown with IPS e.max Hybrid abutment and anterior crown with CEREC C In Bloc (Stain and Glaze & Clinical Applications of CAD/CAM). Doctor Kunkela is an innovative Czech dentist with extensive experience in prosthodontics, restorative dentistry, preventative care and dental marketing. He currently presents his research in Czech Republic, USA, Germany, France, Ireland, Malta, Poland, Hungary and Slovakia. He also organizes practical courses in prosthodontics and CAD/CAM dentistry in the Czech Republic. His studies are published in the dentistry journals Quintessence, International CAD/CAM Magazín, Dental Tribune and DentalCare Magazine. Parallel to the Desert Safari, participants who attend the Panel Show presentation ‘CEREC Meets Smile Design’ have the possibility to take part in the practical part provided in the afternoon which will include hands on demonstrations given by Dr. Josef Kunkela, CZ. The hands on course will allow a practical demonstration of smile design process and virtual articulation. Dr. Josef will focus on the used-protocol and applied materials such as preparation techniques and differences between preparing a vital versus endodontically treated tooth for CEREC only, as well as a comparison of scanning techniques used by Bluecam, Omnicam and Apollo DI scanners. Different milling process techniques and grinding will be shown and the effect of software parameter changes on final results. Often, the localized subgingival margin that can complicate the use of indirect adhesive restorations (isolation, scanning, etc) subsequently hinders restoration durability and relationship with the periodontal tissues. Thus the presenter will discuss in detail the Deep Margin Elevation technique. Further focus will be given to options of anchoring, material choices, postendontic treatment – endocrowns, errors and conclusion and supporting case reports. The hands on course will finish with practical demonstrations of smile design and virtual articulation. Mohammad Al-Zu’bi-RDT, owner of Optimus Dental Lab Inc. a Crown & Bridge lab which focuses on Digital Dentistry and CAD/CAM Technology. Mr. Al-Zu’bi is a Sirona Beta Tester, Sirona International speaker/trainer, CEREC & inLab basic/advanced Trainer, Founder of the inLab Study Group. Among the venues he lectured and trained CEREC 27.5, Scandinavian CAD/CAM Days, Amici Di Brug, Istanbul Digital Dentistry Symposium, Chicago LMT Lab days and Chicago inLab Summit. He has been a dental technician for 18 years working in most lab departments. Dental Technicians will witness firsthand how the inLab system works for non-users. Digital work flow in Dental Laboratories and the materials used with the system will be shown as examples as well as the utilization of the system to the fullest potentials. Hands on demonstration will include single unit design / multiple units design, parameters, BioCopy, link options (Group & Symmetrical), smile design, bridge design, virtual articulation, scan & design tips, implants: abutment design, implant crown design, screw/cement retained implant bridge, material overview and Sirona Connect. Dr. Munir Silwadi will provide participants with an eight hour workshop realizing the steps required to produce Chairside CAD/CAM restorations whilst comparing the steps needed to produce laboratory generated indirect restorations to ondirect chairside restorations. Participants can expect to develop their knowledge required to produce indirect CAD/CAM restorations. The hands on course will begin with an introduction to CEREC system hardware/software followed by a demonstration and practice of partial crown on standard models. Further theory and practical work will include partial crown on actual case models including bonding and chairside polishing. Participants will receive a certificate accredited by HAAD and ADA for 6.75 CME and CE Credits. By registering on the official cerecfest.cappmea.com website, participants will have the opportunity to attend all five Table Clinic Presentations mentioned above. All dentists and dental technicians are invited to part take in this breathtaking spectacle. We look forward to welcoming you to The Palace Hotel Downtown Dubai.